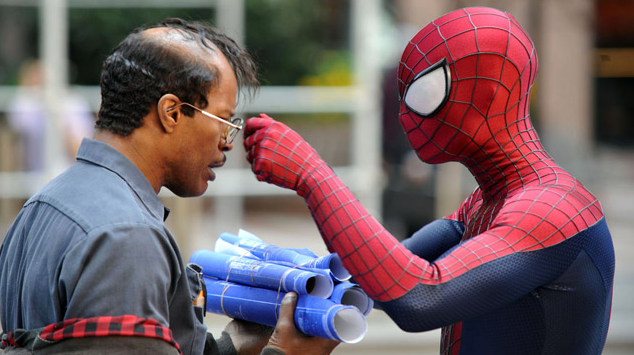 After 2012’s reboot of the Spider-Man franchise (The Amazing Spider-Man) Mark Webb returns for The Amazing Spider-Man 2. Where the first movie was trying to emulate the style Christopher Nolan’s hyper-real Batman reimagining, this movie goes full into comic book mode, boasting colorful villains, giant action setpieces and an abundance of trouble for the hero Peter Parker (Andrew Garfield). And while the movie doesn’t reinvent the wheel – or convert any people who aren’t already on board of the superhero train – it offers a solid enough story to entertain for its quite long running time. 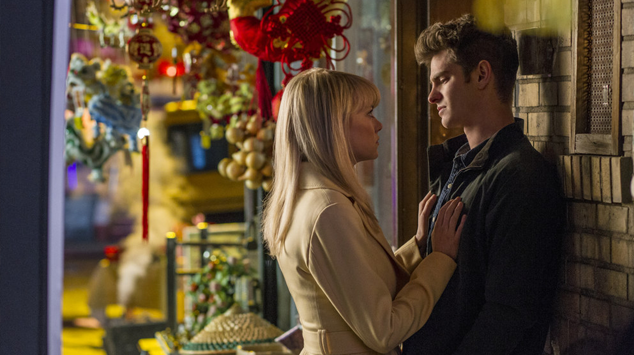 It’s been an uphill battle for Sony’s Spider-Man reboot since the first day and The Amazing Spider-Man didn’t do much to convince movie goers otherwise. It had some glimpses of potential storylines that could be explored but never went in those directions. Peter Parker’s parents were teased but there was no sense of resolution. The tower of the giant Oscorp Corporation towered over New York promising things to come. But before that we had to wade through the same old origin story to finally get Spider-Man back into the costume and I really hope that the next iteration of Spidey (or any other established superhero) will not need another origin story. In fact one can watch The Amazing Spider-Man 2 without the first part since everything that is different in this version is either introduced in the prologue (Peter’s father), dialogue (Harry Obsorn) or has no impact on the story (webshooters). Freed from the exposition the movie cuts right to the Spider-Man we know and want to see and from the first minutes it is clear that this franchise no longer tries to be grounded in any sort of reality. It is a colorful mix of action and CGI that adequately pass the time. And let’s face it: when you are dealing with electrical monsters your plausibility has already gone out of the window. One of the movie’s villains Max Dillon a.k.a. 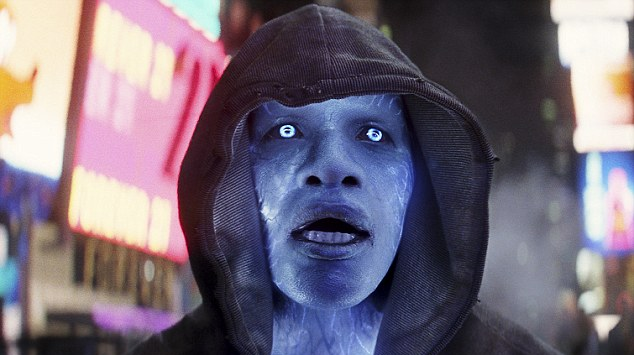 Electro (Jaime Foxx) is the biggest indication of the aforementioned comic-book direction. When everyone else gets a day off Max has to work despite the fact that it is his birthday. Working in a very unsafe environment the repair work goes wrong and the next second Max is attacked by genetically engineered electric eels turning him into a supervillain who runs on any form of electricity. We meet again, for the first time! I am pretty sure that Electro was only thrown into the mix to add some color and make the movie look a bit fresher because the main threat is not Max Dillon but Harry Osborn (Dane Dehaan). Having inherited a skin disease from his father Norman (Chris Cooper) he feels the ticking clock and is on his road to become this franchise’s version of the Green Goblin. Dane Deehan once again plays an initially likable character who descends into madness similarly to his work in Chronicle. And it is mostly because of Garfield and Deehan that there is at least some sort of sympathy from the audience because we are introduced to Harry and Peter and told that they happen to be best friends even though we have never seen Harry Osborn in the first movie. 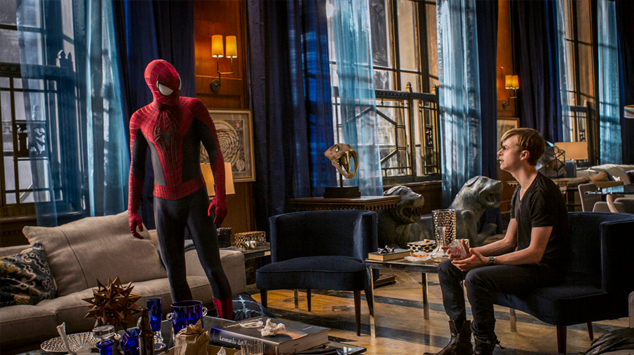 While the drama is driven mostly by the Goblin storyline – which also ties nicely to Spider-Man’s origin and finally resolves the story about Peter Parker’s father – Electro is always thrown in to distract us from the fact that we are watching a condensed version of Sam Raimi’s original Spider-Man run. Raimi’s trilogy famously built up Harry Osborn (played by James Franco) as the villain for the third part and completely blew it. And watching this movie reminded me again of why I was so disappointed with Spider-Man 3. This new version of the conflict is never as deep as the Franco/Maguire story could have been but contrary the third original Spider-Man it works on its own – if you accept some story contrivances. Yet despite all of this Spider-Man retains his sense of optimism and this is the key factor which won me over for this movie. Sure there are a million contrivances but at the heart it is about a person trying to do the right thing. Not on a global scale but on a personal scale – which is of course heightened because of the powers for cinematic effect. Even Gwen Stacy (Emma Stone), Peter’s girlfriend, has a decent enough story arc. Sure she can’t fully escape the genre but at least she is not a complete damsel in distress stock character. Of course the only things she is allowed to do are things that are written into the story because of her needing to do something (similarly to part 1) but Garfield and Stone have enough charisma to sell their story and make it work. The Amazing Spider-Man 2 is not a movie that makes me think it could have been much more like Spider-Man 3 did. It pretty much achieves what it set out to do and never falls into pits like Spider-Man 3 did. It is a perfectly servable superhero movie which aims at the target audience kids/teenagers and succeeds more than the original installment of this rebooted Spider-Man. If there is enough story for Sony’s spinoff plans as well as two more installments with Spidey is still a question that needs answering. P.S. : For more Spidey conversation (in German) head over to our second podcast!